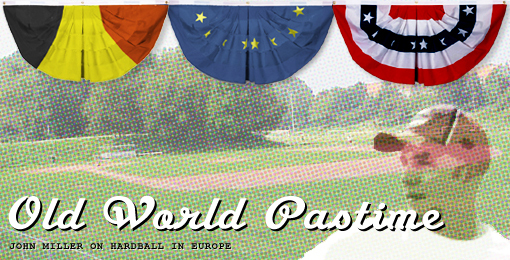 John Miller, a Belgian-American journalist, and a player/coach for the Brussels Kangaroos, is in his fourth year of writing Old World Pastime, a take on baseball as lived in 21th century Europe. Talent development in baseball is a pyramid, and the success at the tip of the European game is possible because of the thousands of coaches from Lisbon to Moscow. So all of us can be proud this month with the Netherlands’s Rick Van den Hurk and Italy’s Alex Liddi getting called up to the major leagues. For Van den Hurk, it is the fifth straight season he has appeared in a major league uniform. Back to him in a sec. Liddi, 23, is the first Italian native to play in the bigs. I met him last year in Tirrenia. He has that powerful hulking physique that just screams big leaguer. An Italian Stallion. Liddi started his minor league career at 17 and already has 85 professional homeruns. He is, at this writing, 1 for 6 in the bigs with a double. Given his dynamite track record — he hit 30 bombs in AAA this year — he should receive plenty of opportunity to play at the highest level offered by his employer, the Seattle Mariners. Then there is Maximillian, or “Max”, Kepler, the 18-year-old son of classical ballet dancers from Berlin whom the Twins signed in 2009 for a record $750,000+ signing bonus. At only 18, Kepler hit .262 for the Elizabethton Twins in the Appalachian League this year. His on-base average was .347, and he hit his first dinger. He’s now list at 6ft4, 180 pounds, and my scout friends say he’s thought to be progressing on track. Holding your own in pro ball at age 18 is no mean achievement, and a sign that the major leagues beckon down the road. Youth is key, Van den Hurk, only 26, has already appeared in 45 major league games for the Marlins and O’s, and given his youth, he could still blossom. I met the tall Dutchman when he, somewhat unbelievably, managed to bring a group of major leaguers on a tour of the Netherlands and Belgium last November. He has a passion, and a skill, for spreading the gospel of the game. Jason Holowaty, MLB’s game development manger in Europe, recalls when Van den Hurk first told him of his plan to bring big leaguers to Europe. “He had the words, which is common, but then he had actions, which is not,” says Holowaty. So I was pleased to see the Orioles call Van den Hurk back to Baltimore. After seeing him pitch a scoreless inning in relief against the Blue Jays on Sept. 1, I sent him a congratulatory email. And Van den Hurk will continue giving back and being an ambassador for the game. From November 5 to 12 this year, he and his companions will visit Utrecht, Amsterdam, Prague and Parma. (Link). The players include Van den Hurk himself, Adam Jones, Jeremy Guthrie, Roger Bernadina, Dexter Fowler and Jair Jurrjens. The last two are still to be confirmed. Yes, Europe has great food and monuments. And, now, some big league ballplayers.